It’s been a dream autumn for our harvest team at Waipara Hills this year; a long string of warm clear days producing some truly stunning wines across the varietals. This year’s fruit produced arguably some of the best Pinot Noir I have seen in Waipara in ten years. The summer was mostly dry and while we had some consistently warm temperatures it was certainly not hot. The rule of thumb for great reds is good conditions in February. Having enjoyed exactly that, our Pinot Noir rewarded us with beautiful texture, mid palate sweetness, balanced with ripe skin and seed tannin. I love all my children, but when Pinot Noir performs like this, it really puts a smile on my face! On March 23 the first fruit off the vines was the Pinot Noir for the Waipara Hills Rosé, from the Home Block. We were thrilled with the quality this year, which expressed bright, lifted perfumed characters with juicy concentration. The longer hang time on the vines also benefited the Pinot Gris, which achieved beautiful ripeness in the settled conditions and we saw this reflected with similar results across all of the whites. The last of the fruit to come in was the Riesling, hand-picked on June 2 off The Mound vineyard. It built flavour later than normal and was exceptional. Our Waipara Hills Vineyard Manager Jean-Luc Dufour shares my fond memories of the 2016 harvest. The crop thinning just prior to harvest was a critical activity to maximise potential ripening ability of the fruit, on the back of favourable weather in November and December. Jean-Luc said we had the longest ripening period without rainfall he has experienced in more than 30 years of grape growing. He is looking forward to some exceptional wines this year. Head of hand-picking was Ben Roiri, Assistant Vineyard Manager at the Home Block. His team this year was a cultural melting pot, from Chile, Argentina, France, Czech Republic, and of course New Zealand. The clean and ripe fruit certainly made his life easier, thanks again to the favourable autumn. It was a first crop from the Grüner Veltliner, which made an impression on his pickers due to the unfamiliar look and bunch shape. 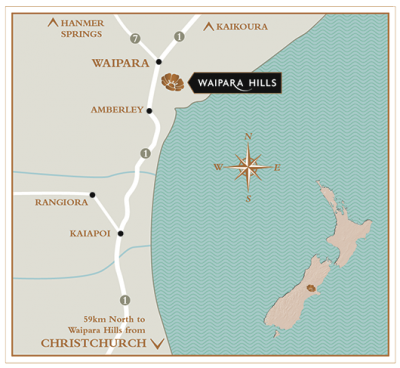 Our Waipara Hills Equinox wines are all created from this hand-picked fruit, capturing the unique terroir of the Waipara Valley region, with an emphasis on texture and structure. As each of the hand-picks came into the winery it became evident that this season was producing excellent fruit. 2016 was such a great harvest and I can’t wait to follow these wines as they unfold in the cellar before we get them into bottle. I look forward to taking these wines out to the world and sharing the stories of this harvest, the harvest that will be remembered for the endless dreamy autumn.